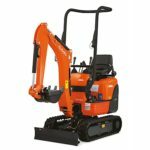 We stock the complete Kubota range of diggers; from the Micro Digger all the way up to the behemoth 8 Ton Digger. We now also stock the 14 Ton JCB JS131. Kubota, in our eyes make the best Mini Diggers on the market - not only do they have class leading performance for their size but they are also the most reliable and some of the smoothest machines to operate on the market. All of our machines are capable of being fitted with augers and breakers and cabbed machines are able to be fitted with cab guards for extra peace of mind. 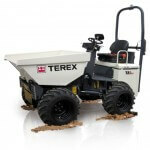 We stock dumpers from Terex, Wacker Neuson and JCB and go from 0.5 Ton Dumpers up to 9 Ton Dumpers. Starting at the half a ton JCB Tracked Micro Dumpers, progressing toTA1EH High Lift Dumpers and then on to Terex and Wacker Neuson 3 Ton Swivel Dumpers, then on to Terex and Wacker Neuson 6 ton Swivel Dumpers and finally finishing on 9 Ton Terex and Wacker Neuson Dumpers. We only stock the best brands, all are fitted with green seatbelt beacons and we ensure that there are no rips in the seats - as no one likes a wet bum! All of our 80cm and 120cm rollers are the latest Bomag AD-5 model and latest HAMM HD8, HD12 and HD14 models and all come with folding roll over frame and working water sprayers. All are fitted with Amber Beacons and all with Green Seat belt beacons. If you need help or would like to book a hire call 01543 672 730 now to speak to our team. WE HIRE TO EVERYONE - General Public, Companies, Local Authorities. No Account Required, No Deposit Needed. To book can take as little time as 3 minutes! Hiring from us is as easy as 1-2-3! Call and let us know you want and when, and any extras you need. For legal and insurance reasons. Driving license or passport and a utility bill. Over 18s. 2 Forms of ID needed. Booking a machine has never been easier, we pride ourselves on making hiring Mini Diggers, Dumpers and Rollers in the UK as easy and as quick as possible. All our machines are EU compliant and certified. All of our machines are fully tested by a third party every year. We hold a full and comprehensive service history on every machine. We're here to help and provide full safety instructions with each hire. We stock the best machines and keep them well maintained. 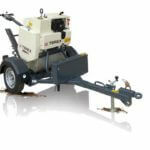 We have a large stock and always have machines available immediately.